Hi everybody, apologies for the lack of news over the last few months. As you possibly know, just over 12 months ago I found myself without a ride. 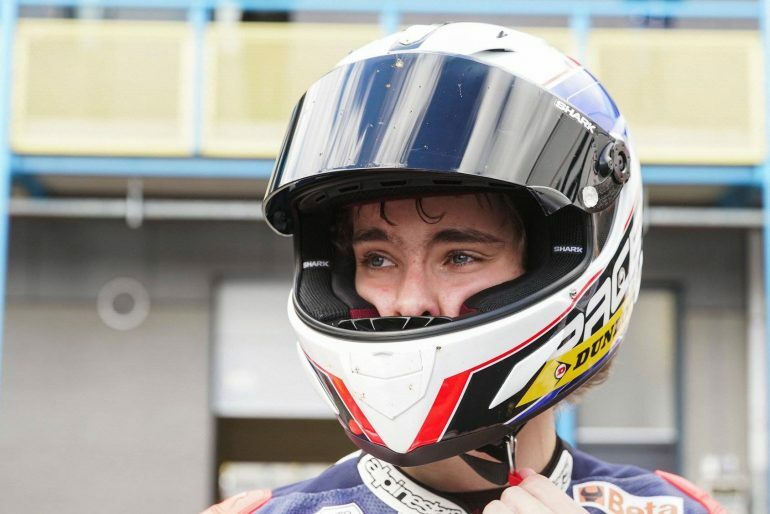 I was very grateful to be offered a place in the first ever British Talent Cup, which I was delighted to accept as it offered a pathway into the Moto3 world championship on the Road To MotoGP programme. Much to my disappointment I have found that there was no prize for me winning the British Talent Cup. It is a shame, but I am thankful for the opportunity. It was a season in which I rediscovered the joy of racing and I am proud of what I achieved, especially at Assen where I raced and won with a broken foot. For me, that was the weekend where I won the Cup! The last few months have been spent looking for a competitive ride in the Junior World Championship. We started speaking to teams at the last round, in Valencia, in November and it was clear that most of the main seats were already allocated and the others required a budget in the region of £200,000. There was one top team which was very enthusiastic about working with me and whose sponsor seemed keen to support me. Unfortunately, after months of talking, it wasn’t to be, as it would have required changes to the team structure to support me, and it just wasn’t possible. There are still a few good rides open in that championship, however the funding required to join them is beyond our family’s means – especially as there is no guarantee as to where it will lead in 2020. So this is why we have decided to focus on joining the British supersport championship for 2019. This is a great series that provides a proven path to higher levels. Cal Crutchlow, Jonathan Rea, Tom Sykes and the Lowes brothers, to name a few, all raced in this championship, and it will provide a tough challenge for me. I really enjoyed racing the Kawasaki ZX-6R in the Scottish championships and some national superstock rounds last year, so I won’t be going in completely cold. I love riding the 600s and know that I can do well. I also will learn a lot racing against some of the toughest and most experienced riders in Britain. Being so late means that all the main seats have been taken. The established teams have their plans in place, so we are in the process of putting our own privateer team together. The budget for racing at this level is between £60-90,000 for the season. The most basic level will allow us to get out on the grid with a reasonably competitive bike, while more budget obviously allows us to put out a higher specification bike, get in a bit more testing and use our full allocation of tyres. I am actively looking for a title sponsor to help us compete at the best possible level our budget allows. If you have a business and would like to promote it through our racing, please do feel free to get in touch through the contact page on this site. Many of you have also mentioned that you would like to get involved through crowdfunding. This is something that we had not really considered in the past, but I am in the process of setting something up and hope to have something to share in the next few days. Thanks for all your support. It means a lot!